I think I have a lot of good qualities as a librarian. I’m good with computers, I read a lot, I’m patient, I like people – et cetera. However, I am terrible at crafts. In fairness, that more talented co-worker is exceptionally talented. Kids who attend her craft programs leave with something that you’d pay $20 for at an art fair. We keep trying to convince her to write a book, and that book would be a godsend to crafty types everywhere. I don’t think my crafts would look half so bad if they weren’t being compared to hers. But, you know, they are. And now I have a reputation for making terrible crafts. 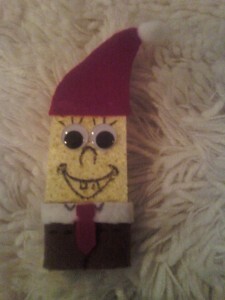 I’ve had some successes – I’m still proud of the Spongebob ornaments – but I’ve had a number of misfires, too. 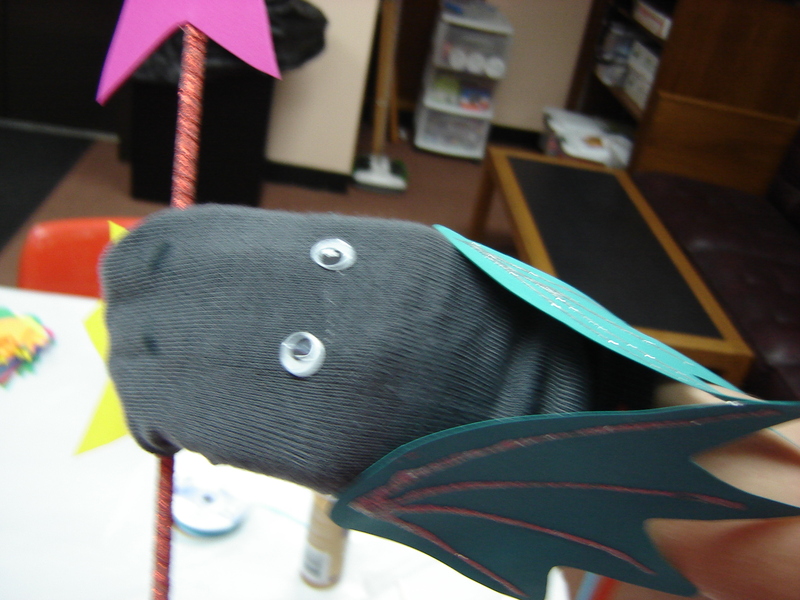 The worst of these, and the reason the kids dread my craft programs so much, took place during a Valentine’s day program. Talented co-worker had given me what she described as “an incredibly easy” craft project for them. There was just one tricky thing – the paper had to be folded a certain way before you glued everything together. Other than that, she said, I couldn’t mess it up. HA. Of course, after being specifically warned about this one tricky thing, I did it exactly wrong, and twenty kids held up these weird glob-shaped things that should have been adorable heart mobiles. One of my regulars now chants, “Don’t screw up!” every time I’m gluing something at the desk. So now the kids dread my craft programs, and frankly, so do I. If I don’t have an Oriental Trading kit to fall back on, a lot of my crafts lately have been things that you actually can’t screw up – like my back-to-school program last month, where I bought a bunch of foam shapes and told them to decorate a ten-cent folder. Woohoo. I realized yesterday that I was supposed to do a craft program today. Worse: a tween craft program. I can get away with “gluing stuff to other stuff” crafts with the little kids, but the tweens will not tolerate it. With no theme and no ideas, I figured I’d go to Michaels before work and hope for the best. I realize that “wait until the last second and then go to the craft store and buy whatever is on sale” is maybe not the best lesson to take from my experience, but it’s the one I got. I will never fear crafts again. Put on your best cape for our superhero party! 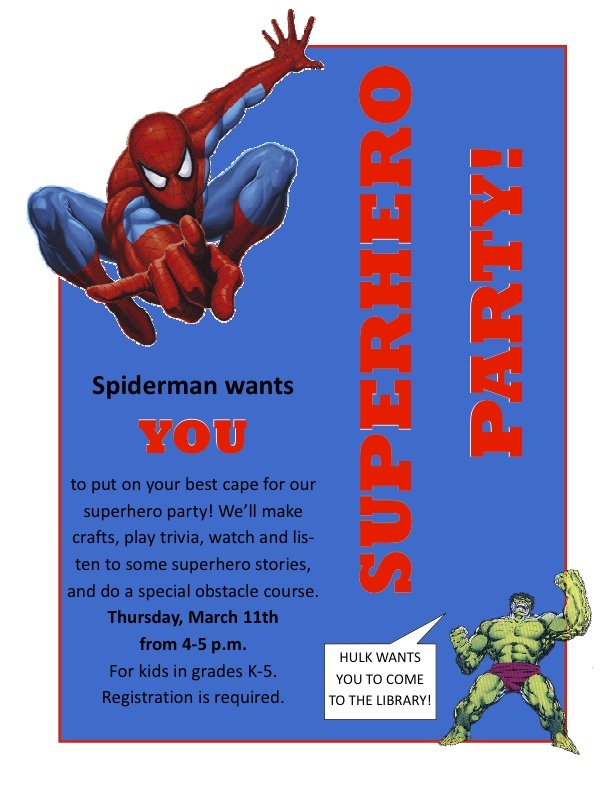 We’ll make crafts, play trivia, watch and listen to some superhero stories, and do a special obstacle course. March 11, 2010 from 4-5 p.m. Objective: Increase awareness of/interest in our extensive collection of Superhero books. Draw reluctant readers (especially boys) to the library. Make a web out of white yarn. Tape the ends of each string (at least one string for every two kids) to a surface and write a number and corresponding letter on either end (A-1, B-2 etc.). Have each kid pick a number, then race to unravel the web and reach their letter! (They need to take the string with them along the way.) Give the first kid a prize! Kids: Decorate masks. Either glue popsicle stick to mask (easier!) or tie a piece of string to hole punched in either side of mask, then tie around back of head. Read aloud Traction Man Is Here! by Mini Grey. Paint a piece of Styrofoam green. Play Hot Potato. Winner gets a prize. Use super-zoomed-in mystery photos of familiar objects, and have each kid guess what they are. Whoever gets the most right gets a prize. – Give out rest of prizes during snack time. This program was a HIT. Everyone loved their capes, masks, and trading cards, and the spider web – the part of the program I was most dubious about – was actually a lot of fun. I wonder if some of this program’s success is attributable to my more-detailed-than-usual agenda…hmm. It also helped to have lots of extra activities planned – it let me customize the program to the group I had. I did read the book, which the kids liked even though it’s sort of a tricky storytime book. Anyway, this was tons of fun, and I would do it again in a second. Also, pretty much all of the displayed books were gone by the end of the program. That’s what I call a success. 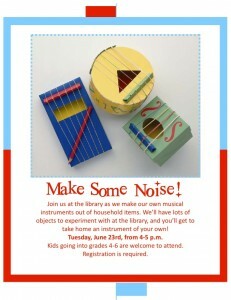 Join us at the library as we make our own musical instruments out of household items. We’ll have lots of things to experiment with at the library, and you’ll get to take home an instrument of your own! June 23, 2009 from 4-5 p.m.
Budget: $8: $3 for three bags of jingle bells (on sale at Target! ), $3 for one pack of 20 plastic plates, and $1.50 for a pack of 25 combs at Walgreens. Pie tins are really expensive, so we used plastic plates instead. Bring some stuff for them to play with – a guitar, keyboard, glass blowing thing etc. Once they finish making their instruments, let them experiment with these other instruments. Once everyone is done, it is time for the least shy among us to parade through the library with our new instruments. Instructions: Each kid gets a plate with 12 holes punched in it, evenly spaced. Cut several pipe cleaners in half. Feed pipe cleaner half through a bell, then push through one of the holes. Instructions: If using a cereal box, cut an oval-shaped hole in the top before the program. Let the kids place rubber bands of various sizes across the box, and glue a paper towel roll to the end of they want. Decorate and play. Author amandaPosted on June 23, 2009 November 20, 2010 Categories crafts, programsLeave a comment on Program: Make Some Noise! 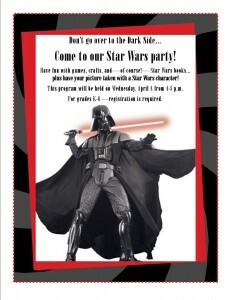 Don’t go over to the Dark Side…Come to our Star Wars party! Have fun with games, crafts, and – of course! 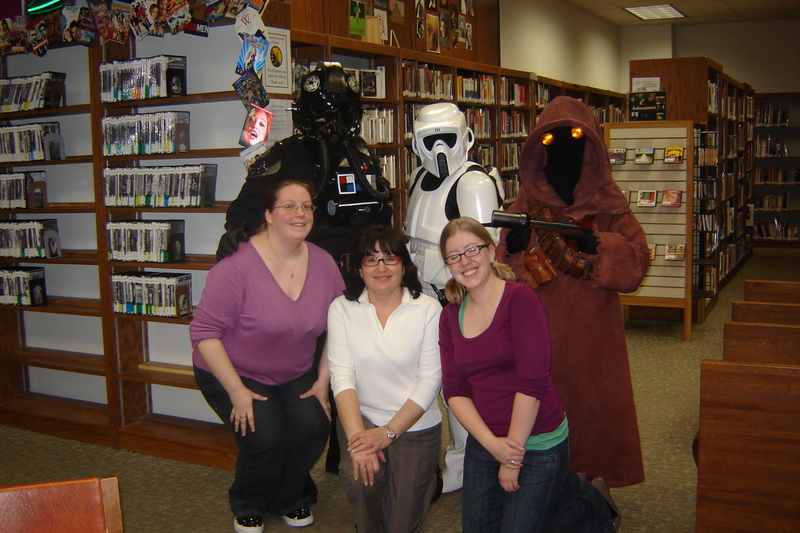 – Star Wars books…plus have your picture taken with a Star Wars character. April 8, 2009 from 4-5 p.m.
Prizes: Star Wars erasers, pencils etc. Budget: $27.50. $20 for wrapping paper (20 tubes) from the dollar store. You’ll want mostly metallic, brightly colored paper, with a few rolls of silver or gold for the handles. You will have plenty left over for other projects – ours was gone in a few months. I was amazed by how many uses we found for shiny paper. $7.50 for two paperback Star Wars readers for prizes. – Build your own lightsaber! Instruct kids to put lines of glue along the long ends of the “blade” wrapping paper, then roll it onto their wrapping paper tubes. Once it is somewhat dry, have them pick out a handle, then put glue along the short ends of that paper and roll it around the tube. Add decorations to the handle if desired. Ta-da! A surprisingly sturdy and totally harmless lightsaber. If glue doesn’t stick, add tape. As the kids finish building their lightsabers, have them pair up and practice hitting balloons back and forth to one another without going out of bounds (off the rug). Reward pair who keeps their balloon off the ground the longest. – Thermal detonator hot potato! With bouncy ball colored to look like a thermal detonator, play hot potato with “Star Wars” theme music. – “Star Wars” trivia contest! Pass out trivia sheets, have the kids fill out their answers, then read them off as a group. Anybody who gets all the answers right gets first pick of lollipops. – Booktalk whatever is left of our “Star Wars” books – picture books, readers, chapter books. Explain where they are located (Darth Vader popsicle stick). – Book raffle! Have kids fill out lightsaber name tags and have one of the special guests pick the winner(s). – Special guests! Have the three members of the 501st Midwest Garrison play the games, help with lightsaber construction, and of course get their picture taken ten million times. – Have crayons and “Star Wars” coloring sheets and word searches available on tables if kids finish activities early or don’t want to participate (or get hit in the face with a lightsaber). Author amandaPosted on April 11, 2009 November 20, 2010 Categories crafts, programsLeave a comment on Program: Star Wars! Come share the luck o’ the Irish as we celebrate St. Patrick’s Day (or Lá Fhéile Pádraig). 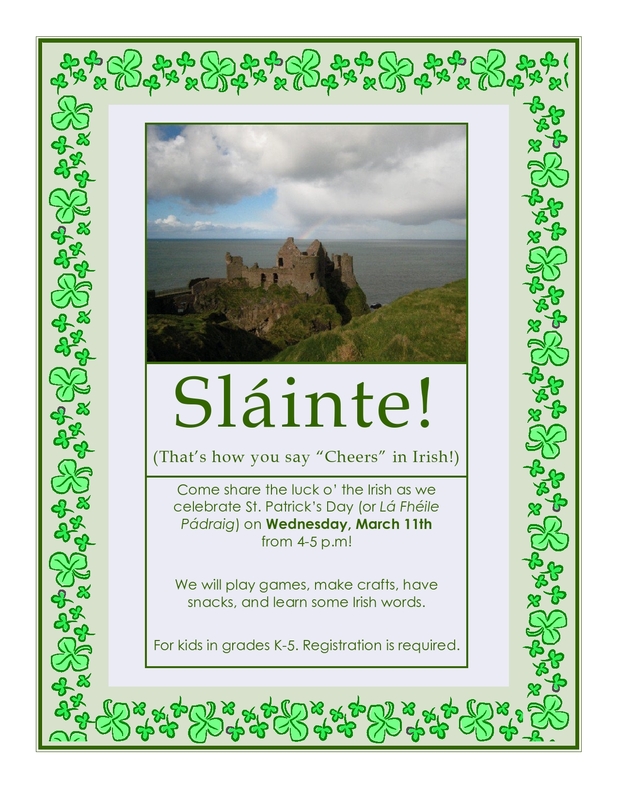 We will play games, make craft s, have snacks, and learn some Irish words. March 11, 2009 from 4-5 p.m.
Prep: Hole-punch (two holes, on opposite sides of bowl rim) bowls. Tie a piece of yarn to each side. Kids: Decorate bowls with glitter, feather or pom-pom, and stickers. Tie yarn under chin. Hat! Prep: Cut streamers (6 per child) about the same length. Cut pieces of yarn (1 per child) long enough to tie to windsock and attach to something. Kids: Pick paper, decorate (horizontally). Glue, tape, or staple streamers to bottom of paper. Glue, tape, or staple short sides of paper together. Punch two holes, one on each side of the windsock. Tie yarn through the holes. Windsock! Hide a bunch of coins around the room. Line up the kids and then send them off to find the coins. Keep some coins to hand out to good sports (to discourage pushing, shoving, etc.). Winner gets a prize. Teach the kids how to say “Happy St. Patrick’s Day” in Irish. Teach them how to say “Cheers”, then pass out leprechaun juice in pairs. Make each pair say “Slainte” to each other. Post-juice, anyone who remembers how to say “Happy St. Patrick’s Day” (or almost) wins a prize. Then everybody gets a lollipop. Remind them about the St. Patrick’s Day display and our many books about St. Pat’s, Ireland, and leprechauns. We had a great time tonight playing SpongeBob trivia, checking out our (seriously extensive) collection of SpongeBob books and DVDs, and making this awesome SpongeBob Christmas ornament! It’s an inexpensive project and they turned out really cute. Advance Preparation: Each kid will need one half-sponge, two pieces of yellow pipe cleaner for arms, two short pieces of brown pipe cleaner for feet, two googly eyes, and felt clothes: a Santa hat, shirt, pants, and tie. (SpongeBob traditionally wears brown pants, but for Christmas, I gave the kids the options of green pants.) I cut and counted all that stuff out in advance, then put the components onto a paper plate (one for each kid). Instructions: Attach pipe cleaner feet and arms by putting some glue on one end of the pipe cleaner, then sticking it into the sponge. The feet go on the bottom of the sponge, and the arms stick out of the side of the sponge about a third of the way from the top. Bend the feet so that they look like, well, feet. Glue the pants on the bottom part of the sponge (you want them to hang over the edge of the sponge), then glue the shirt on top of the pants, and the tie on top of the shirt. Decorate as desired (some kids drew the line down the middle of the pants, some drew on a shirt collar, etc.). 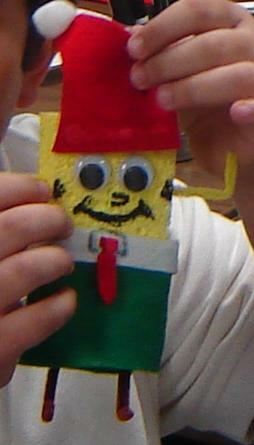 Next, glue the pom-pom to the end of the Santa hat, and glue the Santa hat to the very top of the sponge. Glue the eyes on underneath the hat, then draw SpongeBob’s face! Finally, make him an ornament. Straighten out the ornament hook, put some glue on both ends, then stick both ends into the top of the sponge (behind the Santa hat) so that the hook looks like an upside-down “U”. Thread some metallic string or ribbon through the hook and tie it so that it’s long enough to hang from your tree. Done! Author amandaPosted on December 4, 2008 November 20, 2010 Categories crafts, programs1 Comment on Program: SpongeBob Christmas party!